Withania somnifera (Ashwagandha) root extract possesses a broad range of pharmacological activities. 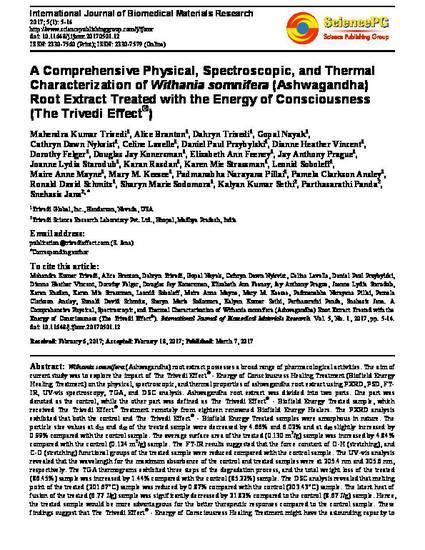 The aim of current study was to explore the impact of The Trivedi Effect® - Energy of Consciousness Healing Treatment (Biofield Energy Healing Treatment) on the physical, spectroscopic, and thermal properties of ashwagandha root extract using PXRD, PSD, FT-IR, UV-vis spectroscopy, TGA, and DSC analysis. Ashwagandha root extract was divided into two parts. One part was denoted as the control, while the other part was defined as The Trivedi Effect® - Biofield Energy Treated sample, which received The Trivedi Effect® Treatment remotely from eighteen renowned Biofield Energy Healers. The PXRD analysis exhibited that both the control and The Trivedi Effect® - Biofield Energy Treated samples were amorphous in nature. The particle size values at d10 and d50 of the treated sample were decreased by 4.66% and 6.02% and at d90 slightly increased by 0.99% compared with the control sample. The average surface area of the treated (0.130 m2/g) sample was increased by 4.84% compared with the control (0.124 m2/g) sample. The FT-IR results suggested that the force constant of O-H (stretching), and C-O (stretching) functional groups of the treated sample were reduced compared with the control sample. The UV-vis analysis revealed that the wavelength for the maximum absorbance of the control and treated samples were at 205.4 nm and 205.6 nm, respectively. The TGA thermograms exhibited three steps of the degradation process, and the total weight loss of the treated (86.45%) sample was increased by 1.44% compared with the control (85.22%) sample. The DSC analysis revealed that melting point of the treated (201.67°C) sample was reduced by 0.87% compared with the control (203.43°C) sample. The latent heat of fusion of the treated (6.77 J/g) sample was significantly decreased by 21.82% compared to the control (8.67 J/g) sample. Hence, the treated sample would be more advantageous for the better therapeutic responses compared to the control sample. These findings suggest that The Trivedi Effect® - Energy of Consciousness Healing Treatment might have the astounding capacity to enhance the solubility, dissolution, absorption, and bioavailability of ashwagandha root extract in various forms of pharmaceutical/nutraceutical formulations by modifying its particle size and surface area. Thus, The Trivedi Effect® - Energy of Consciousness Healing Treated ashwagandha root extract might provide better therapeutic response against inflammatory diseases, immunological disorders, stress, arthritis, cancer, diabetes, sexual disorders, aging and other chronic infections.